“Blessed are those who hear the word of God and observe it” (Luke 11:28). It’s one thing to know what to say or do to live out our lives as Christian women. But it’s another thing entirely, isn’t it, to actually observe what we know. To live each day and each moment as who He calls us to be. To not only know the word of God—that we should love, that we should serve those in need, that we should [insert all of the other things we know to be true about God and His word! ]—but to also live our lives worthy of the calling we have received (Ephesians 4:1)! I sat at the intersection in my car as the man stood on the side of the intersection, holding a sign that read, “anything helps.” My heart began to race as I stared straight ahead. My front passenger seat was filled with fresh fruits and veggies. I knew what I could offer, but fear held me back. The light is about to change, I thought. The people behind me will be so annoyed if I start talking to him now, I thought. I continued to stare straight ahead as if the man next to my car didn’t exist at all. “Blessed are those who hear the word of God and observe it.” And there I sat, in silence and inaction. 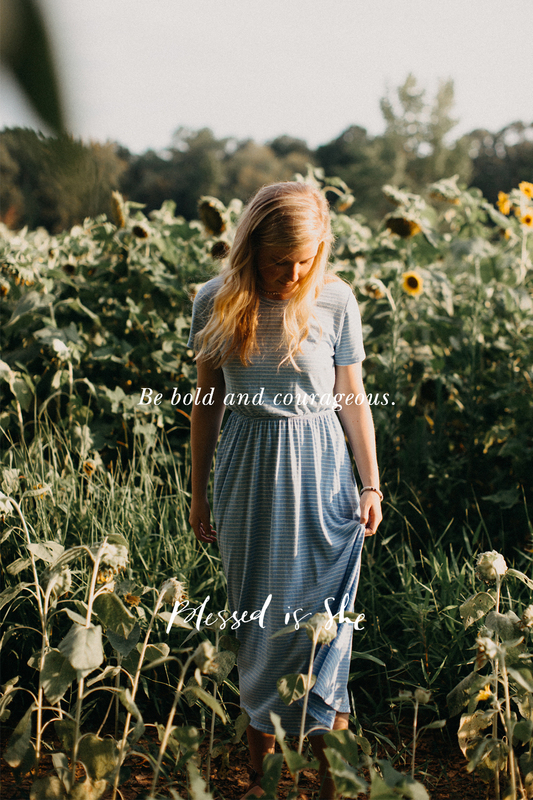 Sisters, we are called to be bold and courageous in our lives. We are called to be women of action and not simply of knowledge. The man that stood holding his sign that afternoon reminded me of a truth that I’m not proud of: at times, I still allow fear to lead me toward inaction. But His word is stronger than fear. And today, I am taking that Truth with me wherever I go, unafraid of the opportunities He might present to me to be a witness in action for His word. Shalini Blubaugh is a Minnesota transplant living in Denver, Colorado with her sweet husband, Matt, their quite large GSD pup, Sully, and baby on the way. She is a health coach and loves pizza, because #balance. Shalini graduated from the University of Minnesota – Twin Cities, served with NET Ministries, and went on to attend Law School. She graduated with her J.D. and happily leaves all things Law behind! Some of her favorites include travel, re-connecting with old friends and making new ones, the ways in which God so beautifully brings all things full circle in His time, and a good, loud thunderstorm. Find out more about her here. Previous Post When Did You Learn to Ride Your Bike? I’ve enjoyed your posts on BIS that I receive daily in my email. My daughter and son in law live in Minnesota and we live in Denver. Bold and Courageous Observance post struck me as I feel the same. I have started up again with my keeping ziploc bags in my car with a bottle of water, a granola bar, a small pair of socks, a toothbrush and toothpaste and a scriptural message knowing that I am praying for them on the street. I started this tradition with my children when they were younger. I just talk to my daughter and she is also doing the same for her community in St. Paul. How special that makes me feel that my daughter has adopted a tradition that we started so many years ago to help the homeless. She also puts the address of a location where people can get a free meal. I may add the phone number and address for the Samaritan shelter in Denver. Blessings to you on your pregnancy and happy and safe labor and delivery to you.